Shoobx - Product - Learn what Shoobx can do for you! The power in our platform comes from its breadth of capability. We can help you with incorporation, hiring employees, creating stock incentive plans, fundraising, and more. Incorporating as a Delaware C corporation has never been easier. Create your company’s charter and file it with Delaware. Establish the structure of your new company from board members to initial company ownership. Start your incorporation today and stand up your company in a matter of days. The actual incorporation workflow only takes 10-15 minutes of your time. Because our computers automate what most people do by hand, incorporating a Delaware C Corporation is only $99 plus applicable Delaware fees. When you incorporate through Shoobx there is no onboarding fee. You can use the basic Shoobx plan as long as you want for free. No strings attached. 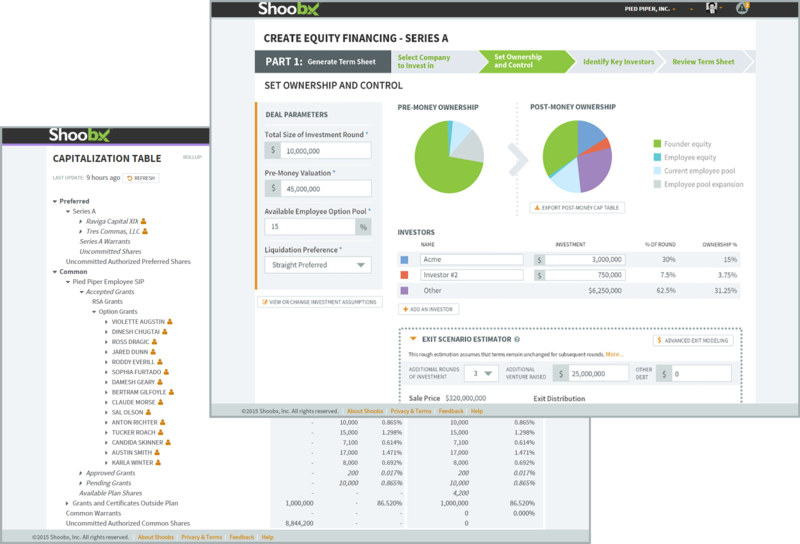 Shoobx features a robust suite of equity management tools, including a dynamic stock ledger and capitalization table that are always up-to-date, in order to provide a clear picture of your equity landscape. Our cap table dynamically links directly to all supporting equity documents so you can stop sending around countless versions of Excel spreadsheets. Shoobx can deal with e-certificates, multiple classes of stock, 83(b)s, automated time-based vesting, stock splits, warrants, and other investment types. Shoobx leverages all of your company data in order to automate a large portion of this typically very manual process. 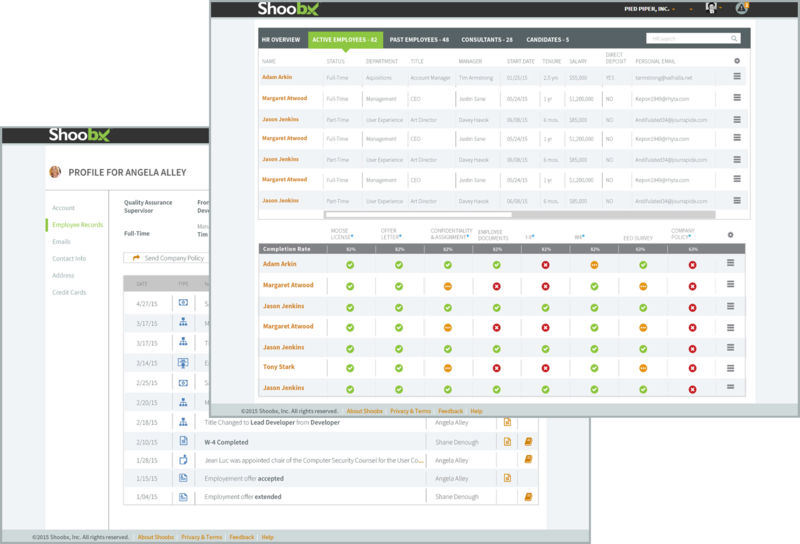 With Shoobx, you can get fast and accurate results with the push of a button. Welcome to the 21st century. Need to hire and manage employees? We can help. 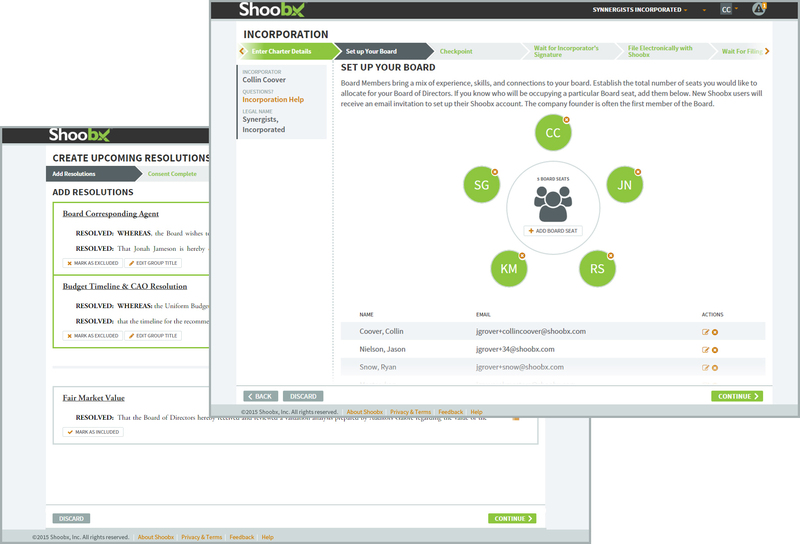 Shoobx manages all aspects of the employee lifecycle with a suite of HR features. Digitally generate, sign, and store I-9s, W-4s, offer letters and any other documentation you have. Manage payroll with our Paylocity integration. 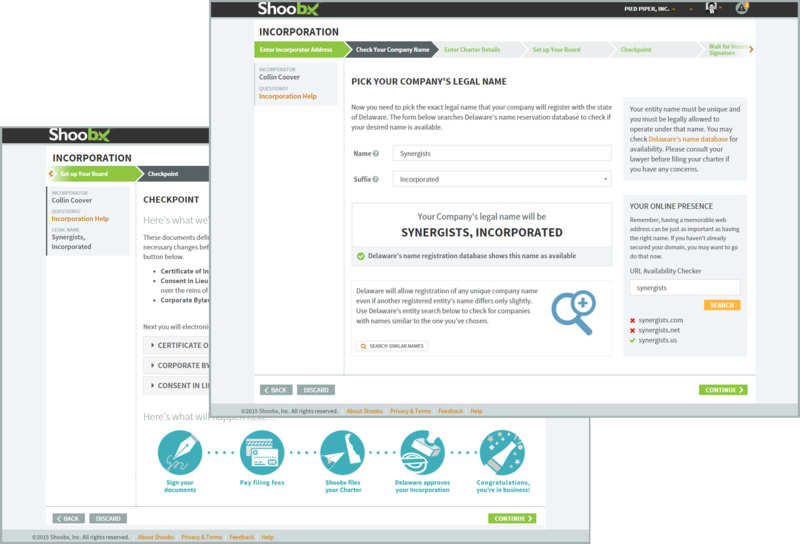 Employees receive their own Shoobx login so that they can access all their critical information. Easily generate key HR reports, including employment eligibility, compensation reports, and onboarding reports. Shoobx also manages your employee directory and automatically produces organizational charts. From consents to board minutes to stockholder communications, Shoobx offers you the tools to manage the approval process and securely store your governance records, all in one place. 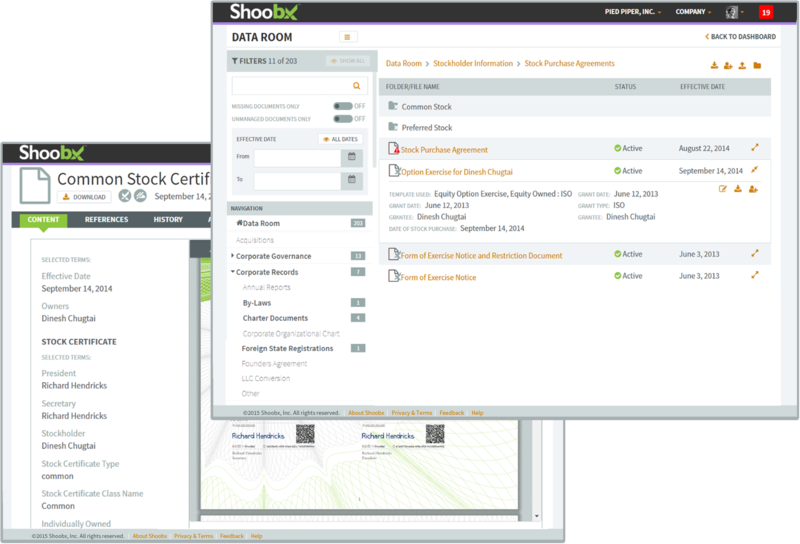 When a board consent is created, Shoobx automatically notifies the appropriate parties to sign the generated consent. The document is then executed and stored in Shoobx. See who has already approved a resolution and which parties still need to sign. With Shoobx, you’ll always know what the next step is. Shoobx captures all your board minutes and written consents. Your company history is safe, secure, and beautifully organized. Time to raise money? We’re here for you. Let Shoobx save you time and money while taking the ambiguity out of the term sheet so you can focus on the things that matter. 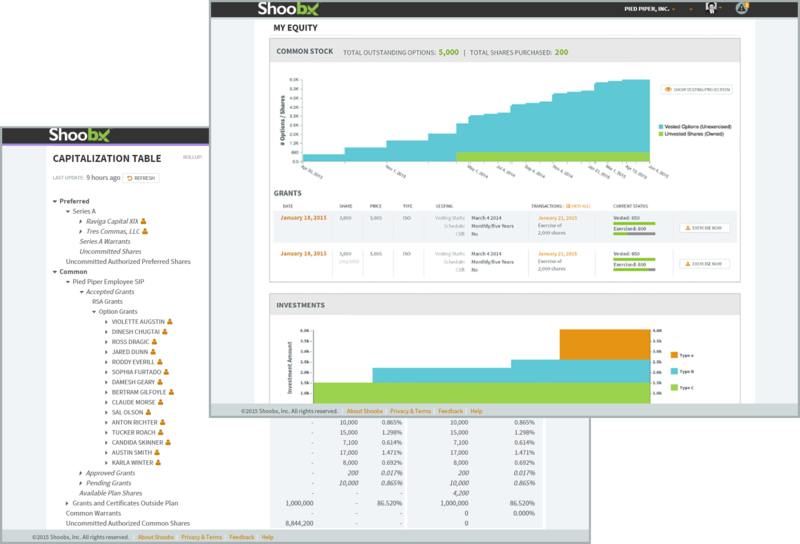 Shoobx enables required parties to perform a due diligence in days, not weeks. Reduce friction and close your deal in a fraction of the time. Deals don’t need to cost tens of thousands of dollars. We can keep more of that money at work for you and your company. Shoobx captures your deal with all of its nuances and makes it a part of your company’s institutional history. Your cap table and all other systems accurately reflect the deal. No additional work required. Shoobx is designed to make interactions with your counsel more efficient and productive. After you register your legal counsel, they will be able to access the documents in your Data Room and, as appropriate, be authorized to act on behalf of your company in Shoobx. Learn more about legal collaboration. With Shoobx, our computers do all the repetitive and tedious stuff so your lawyers can spend their time (and your dollars) in the most efficient way possible. You can customize the degree to which your lawyer is involved on Shoobx. 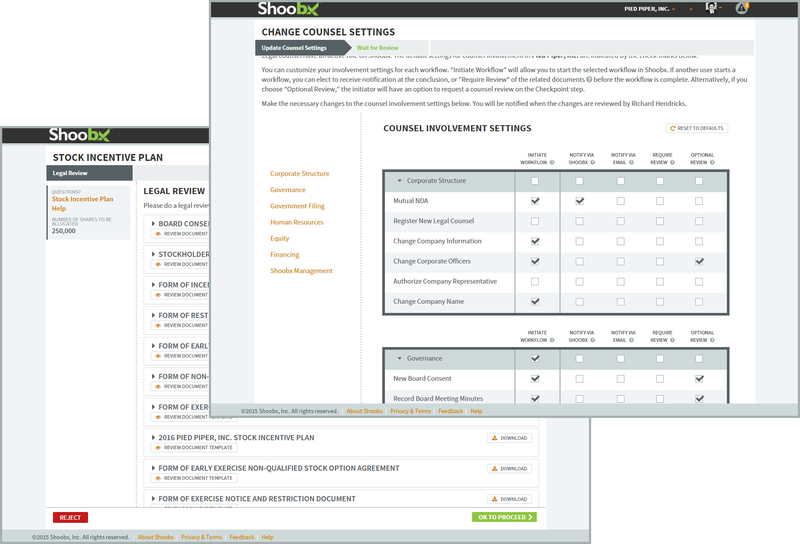 Together, you and your counsel can determine the best way to collaborate on Shoobx. Shoobx helps you organize as you go. You’ll always have the right documents in the right place. With every action you take in Shoobx, we automatically organize your documents in a secure, searchable Data Room to keep your company investor ready every day. Documents generated in Shoobx are automatically added to your Data Room and drag-and-drop upload allows you to easily add others. Stay organized with an exportable document index. You decide exactly who should have access to view, edit, or share your company’s documents—by folder or by document. Our real-time reporting logs all activity so you can track anyone accessing your documents. Shoobx sends notifications about document changes to other parties during due diligence, watermarks document downloads, and tracks diligence activity details in your Data Room. Join over 7,000 users already on Shoobx!